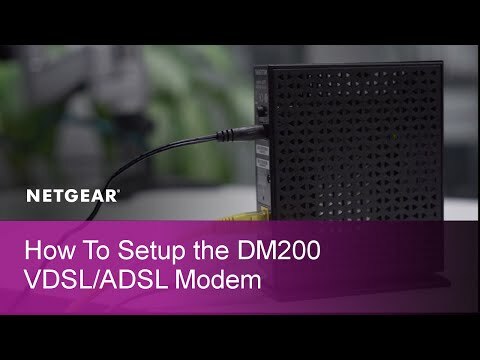 The NETGEAR Broadband High-Speed DSL Modem provides a simple and cost-effective connection to high-speed VDSL/ADSL Internet. With Fast Ethernet connectivity, the NETGEAR DSL modem connects directly to the computer or wireless router. Compatible with major DSL internet service providers and is easy to setup. • Makes any printer AirPrint compatible to print from an iPad or iPhone. • MyMedia—Find and play media files in your network. • Parental controls - Manage web filtering and accessibility by profiles or devices. • For PC, Mac, iPhone, iPad and Android devices. Features • High-speed VDSL/ADSL Internet access. • Compatible with VDSL, VDSL2, ADSL, ADSL2 and ADSL2+. • Easy CD-less installation with Smart Wizard. • Connect to high-speed DSL Internet access. • Connect directly to a computer or wireless router. Netgear DM200 Broadband High Speed Ethernet Modem, Compatible with VDSL/VDSL2/ADSL/ADSL2/ADSL2+ is rated 4.2 out of 5 by 5. Rated 5 out of 5 by vovim from Does the job well This modem was easy to set up and it does the job very well. Rated 4 out of 5 by RedBaron from Works well after installation issues resolved Modem has been operational for over a month now with no problems. Installation was not trouble free as Netgears installation routine stalled near the end of the process requiring a computer and modem restart and manual completion of the installation process. Rated 2 out of 5 by Minty01 from Not as easy to setup as stated by Net Gear After phoning up Net Gear to see which modem they recommend for using with the Net Gear X8 router the tech support representative recommended the DM200. The modem arrived and I started to set it up. I started off by using the setup wizard however the modem wouldn't recognise my DSL line. So I had to manually set up the modem however I don't think I'm getting the best out of it. Rated 5 out of 5 by liamstears from Does exactly what it says Looking around there are not many VDSL modems so decided to give the Netgear a try as it looks better than the competition for a much better price and overall I am pleased, does everything it claims to and syncs at the same speed as other modems I have tried. Well recommended! I see the part number is &quot;...US&quot; and that only North American broadband providers are mentioned in the description. Does this unit have a 3 pin UK mains plug? Yes, it has a 3 pin UK mains plug and another 2 pin mains plug for other countries.